The Identity Dashboard is Dashlane's new one-stop shop to monitor and access many of Dashlane's most important features, and to help you focus your attention where it's needed most. The Identity Dashboard gives you an overview of your password health, is where you can always find any active security alerts, and is where you will set up and monitor several key Premium Dashlane features. The Identity Dashboard is not currently available on the Web app. In the desktop application, you will find the Identity Dashboard in the menu bar on the left under "Security". A module for your Password health, on the upper left. A module for standard security alerts, as well as alerts from the Dark Web Monitoring for Premium users, in the column on the right. A module for the Dark Web Monitoring feature available with Dashlane Premium, as well as the U.S.-only Premium Plus identity protection features, Credit monitoring and identity restoration, and Identity Theft Insurance, on the lower left. To find the Identity Dasboard on iOS, look under "Tools". On Android, tap on the main menu icon in the upper left, then look under "Tools". A module for standard security alerts, as well as alerts from the Dark Web Monitoring for Premium users. 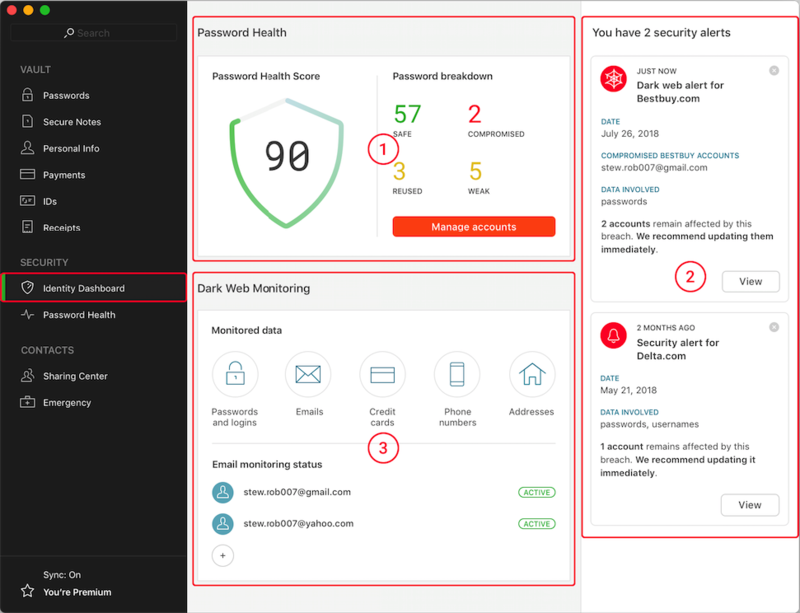 A module for the Dark Web Monitoring feature available with Dashlane Premium, as well as the U.S.-only Premium Plus identity protection features, Credit monitoring and restoration, and Identity Theft Insurance. Password health shows a summary view of your Password Health screen. If you click on Manage accounts, it will take you to the Password Health screen itself, where you can examine its results in more detail. See How to use Dashlane to find out how secure you are for more detail about the Password Health screen. The alerts module shows Dashlane's security alerts, as well as your Dark Web Monitoring alerts if you're a Premium user. Security alerts occur when hacks or breaches have been reported for any of your accounts. See What are security alerts and what to do when I get one for more information. If you're a Premium user, once you've set up your Dark Web Monitoring, you will receive your Dark web alerts here as well. See What to do with your Dark Web Monitoring results for more information. If you are a Premium user, this is where you can set up your Dark Web Monitoring by adding up to 5 email addresses to scan. See What is Dark Web Monitoring and how does it work for more information. If you are a Premium Plus user, here is where you can access your Credit Monitoring and restoration features, as well as your Identity Theft Insurance. For more information about Credit Monitoring and your CreditView Dashboard, read our article about How to set up and use Credit Monitoring. Also, visit our page about TransUnion's Identity restoration service for more information about that feature. Finally, visit our page about Identity Theft Insurance for more information about that feature.